How I got it: As an ARC! 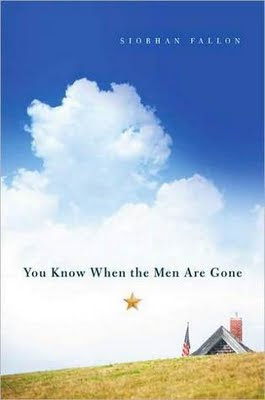 You Know When the Men Are Gone tells the stories of the women who are left behind, waiting for their husbands, soldiers in the United States Army, to return home to Fort Hood, Texas. Each of them has a unique story, their lives are all very different from one another, but they all have something in common: they are Army Wives. They spend their days like normal women, but they also spend their time planning care packages, checking the news to watch for news of more death where their husbands are serving, praying that they won’t recognize any names, waiting for that precious phone call when they get to talk to their husband, to hear their voice if only for a few minutes, and counting down the days until the days until the men come home. When they finally are no longer restricted to those phone calls, but to be able to touch their husbands, see them every day, knowing that for the moment, they are safe. We hear plenty about the soldiers serving our country, but it’s easy to forget sometimes that there are families left here at home. The mothers, wives, girlfriends are all left worrying what might happen. Learning to adapt to life without their husbands. They pay the bills, they take care of their children, they do everything. I grew up in a family where many of my family members have served. My maternal Grandfather and Grandmother served in the Army Air Corps during WWII, my paternal Grandfather served in the Navy, several of my uncles have served as well as a handful of cousins. I’m a third generation employee of the Air Force, which is why the publisher contacted me in the first place. She thought that with my background, I would have interest in the story. This book is a well written narrative of the life an Army wife leads. I felt a connection to each of the characters, sharing their pain and their joy. Each story is short and tells just a small portion of the woman’s story and I found myself wishing I could read just a little bit more about them. I wanted to know what happened next. The stories are appropriately ordered, each of them telling a unique story. I was especially pleased with the last chapter, titled “Gold Star”. I felt it was a fitting conclusion to the book. I was almost a little disappointed to learn that the women in the stories were fictional. At the same time though, it shows the authors ability to create a character that is very real. Overall, a very good read. Sobering, yet inspirational at the same time. My dad is an army vet and so I'm well aware of the many sacrifices of military and their families. This sounds like an great read. Going to go put it on my wishlist now. I agree with the last story being a perfect fit to end it. Really emotional, but I also wanted a lot of these stories to keep going - I wanted to see some of these confrontations between the couples. This is my book club's selection for May. I've heard good things about it and I'm really looking forward to reading it. A friend who has read it also was surprised that the stories were all fiction.